There are plenty of videos on the internet showing large numbers of people cycling in high-cycling towns and cities. Here's a nice example from Copenhagenize, showing morning traffic on Nørrebrogade – allegedly the busiest cycle street in the world. There always seem to be people of a certain persuasion, writing on the internet in English, who react to these videos with the cry of cherrypicking. You are creating a distorted impression of the scale or nature of cycling in these places, they claim, picking deliberately unrepresentative locations or times at which to make these videos. Of course anybody making any kind of political point cherry-picks what they present. When the Cycling Embassy of Great Britain decided to go on a study tour this year, we cherry-picked the nation of the Netherlands to visit. We did not pick Russia, or Berkshire, or Los Angeles. And there was a reason for this. And, strangely enough, a staff team from the London Cycling Campaign soon after cherry-picked the Netherlands to go to, to study cycling policy as well. Coincidentally – nothing to do with me. Surprising? The point about cherrypicking surely is this: one can only do it where there are cherries to be picked. 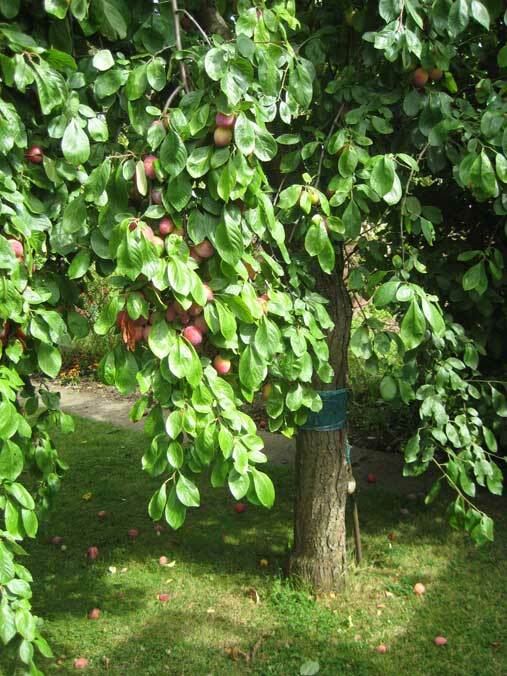 The sort of cherry seen in the Copenhagen video can only be picked in a couple of countries in the western world. There is nowhere else this could have been filmed, that's the point. There is something special going on here, that those other countries, where this could not have been filmed, need to understand. One needs to look for what is common to those countries, regions and cities, where this sort of scene can be witnessed at all. I've stressed this before, but it seems to be one of those things that needs saying again and again. So here is the graph again, a few years old, it has to be admitted, courtesy of CTC, "The UK's National Cyclists' Organisation". It's a pity I can't find a more up-to-date presentation, and one that includes Germany and Switzerland, which have both developed their cycling cultures in the last few years. But here we see how the Netherlands and Denmark stand out "by a mile" (or 1.61 km) as Europe's leading cycling nations, despite being not all that culturally similar. We see how the other Nordic countries, plus Austria and Italy, cluster far behind, but still significantly ahead of the others. And we note that what these high to moderate-level cycling nations all have in common, across major cultural differences, and differences of climate and physical and human geography, is the provision of networks for cyclists separate from motor traffic. Cycle paths and cycle tracks, as you see in the video. And we see there is a perfect correlation. The Netherlands and Denmark have far more cycle-specific infrastructure than the other countries, and they have far higher cycling rates, and genuinely safer cycling. The cluster of nations further to the left all have a significant amount of quality cycle infrastructure, but far less than the Netherlands and Denmark. 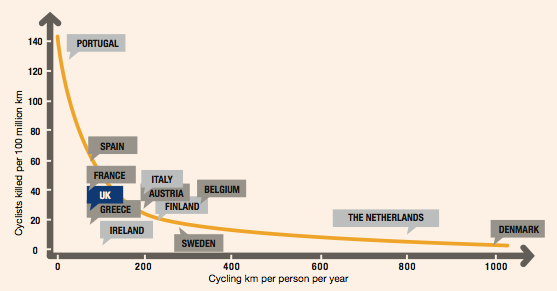 The nations on the left of the graph have hardly any proper cycle infrastructure (though the city of Paris at least seems to be making some progress on this). The CTC wanted to demonstrate in this graph a relationship between cycling safety and numbers of cyclists, which clearly does exist, but they have largely ignored the most important lesson of this data, which leaps out from it: that you get safety and high cycling numbers simultaneously from high quality dedicated cycle infrastructure. Their document from which this graph is taken has nothing to say about infrastructure! I can't cherry-pick a scene in London to video, comparable to the bicycle rush-hour on Nørrebrogade . The closest I can get is this scene in Bloomsbury, which I have shown before. 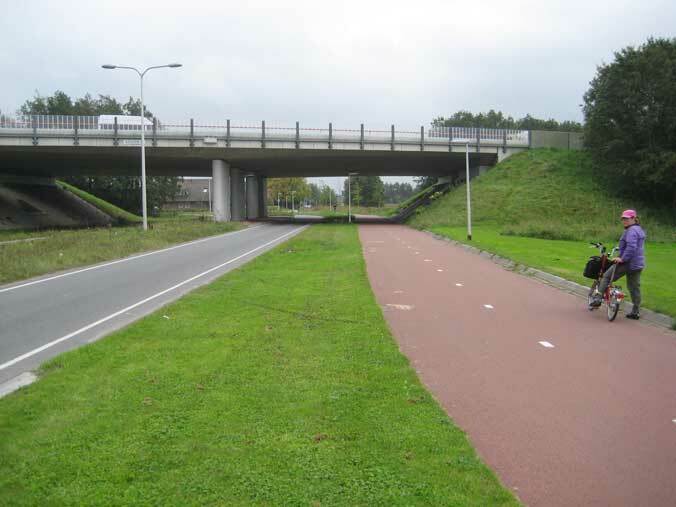 And, funnily enough, the infrastructure in this picture, exceptionally for the UK, looks a little bit like Dutch or Danish cycle infrastructure. What's this got to do with anything? Well, here's another picture from this summer. It shows a slightly sad stall that Gerhard Weiss of London Cycling Campaign was manning for Transport for London at the Gladstonbury Festival in Gladstone Park, Brent. The family-friendly bikes and bike attachments on display here are things not often seen on the streets of Brent. I didn't see them getting much serious interest from locals either. 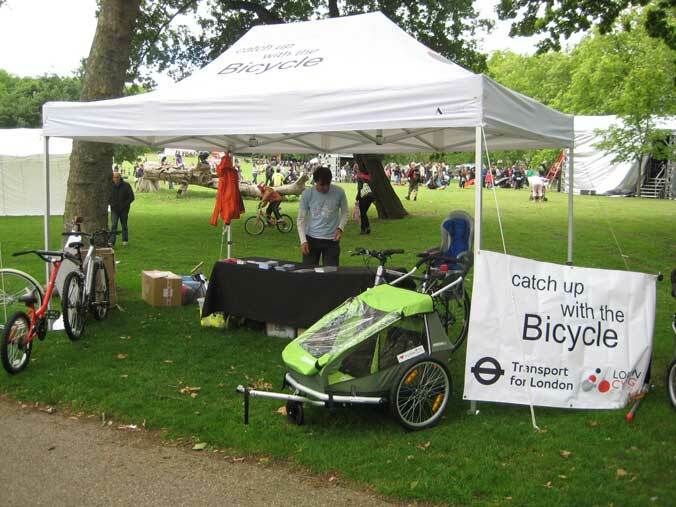 When I asked Gerhard what the purpose of this was, he replied that TfL were paying LCC to take this stall round various community festivals in London, particularly in the outer London Biking Boroughs. TfL's purpose here was to target families with children in these suburbs as "low-hanging fruit", as they chose to put it: people who needed just a little nudge, perhaps as little as being shown the existence of the right type of family-friendly gear, to get them cycling. For the truth is there is no way that many families are ever going to cycle the main roads of Brent with their kiddies in these cycle trailers or child seats, without an infrastructure revolution in London of which there is absolutely no sign. There is no way these families using these contraptions will "take the lane" through the deadly concrete tunnel in Neasden under the North Circular Road, or ride on the equally terrifying motorway-style flyover across the North Circular at Staples Corner: the junctions on that road that lie immediately to the north and west of this park. And, if they want to go the the areas of Brent to the north and west of this park, if they live in Neasden, Wembley or Colindale, these two roads are where they are going to have to cycle. Because there are no other crossings of the North Circular Road for miles in either direction that you could get these bike trailers through. 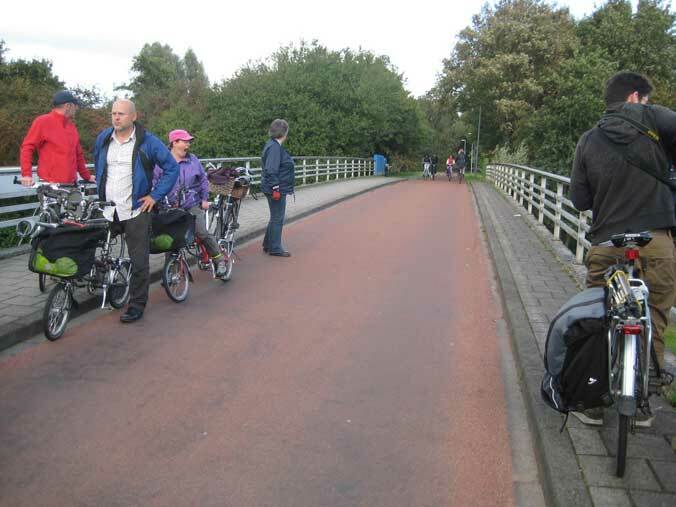 It wouldn't be legal, but just try cycling your bike trailer loaded with its precious cargo round the tight square bends on the ramp up to that footbridge. Just try to get your bike and trailer there in the first place, round those (perfectly legally) parked cars which thoroughly block access to the ramp from the road. 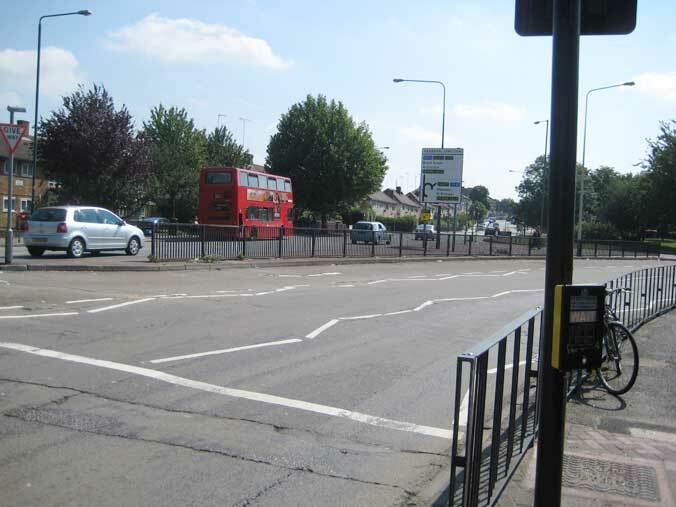 And if you do manage to get across, and you land up on Neasden Recreation Ground on the north side, try getting anywhere else from there without cycling on pavements. You will find you get sucked into the Neasden northern roundabout, a nasty place, of which more later. 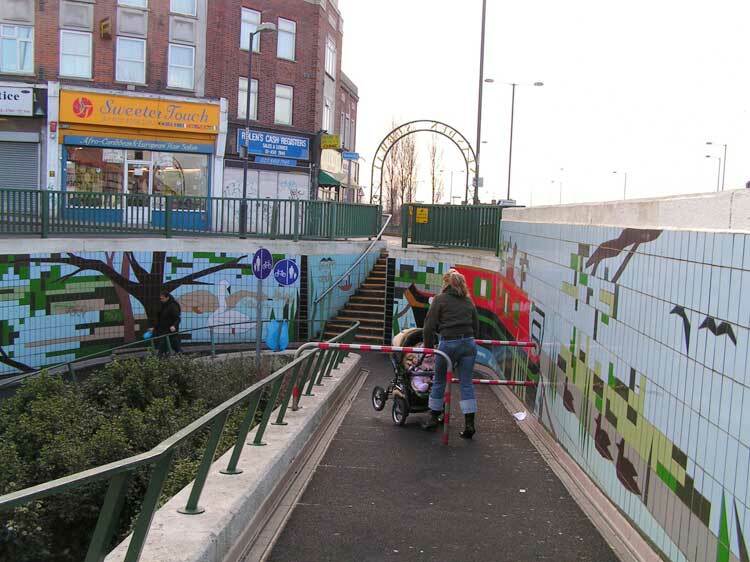 Here's the second off-road option I mentioned, the horrible Neasden cycle/pedestrian underpass. Try getting your Bakfiets or Christiana round those barriers and corners. The lady with the pushchair is having enough trouble. 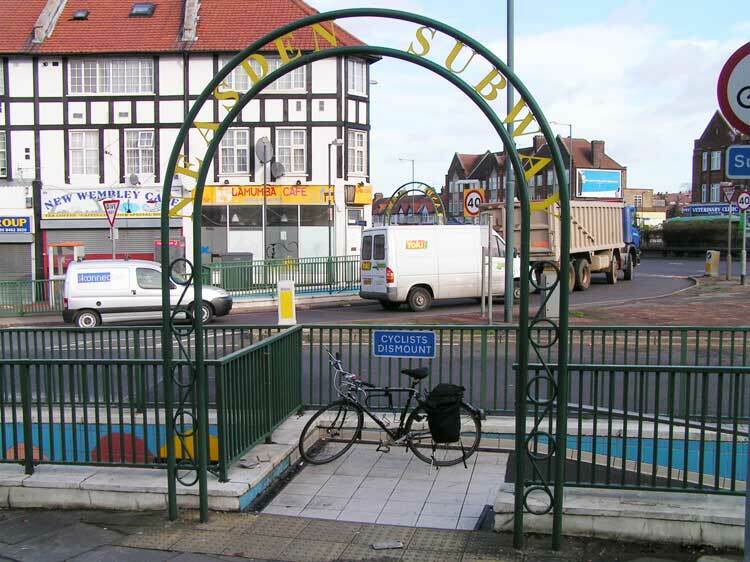 If you just have a normal bike, which you can squeeze past these barriers, and you try to access this underpass from the south, from Neasden shopping centre, you find you have to cycle the wrong way along a stretch of slip road coming off the North Circular, as in this picture. The entrance you are aiming for is marked by the archway in front of the white house. If you take this route, by illegally cycling on the pavement, or wheeling your bike, or ignoring the no entry sign and hopping a kerb, and negotiate the barriers, curly ramp and steep slopes, you end up in this delightful tunnel. The pink slippery tiling is the part specially reserved for cyclists (the part you see all the pedestrians on). I met a woman who had broken her shoulder through a fall from a bike in this tunnel, as the paving is treacherous when wet. 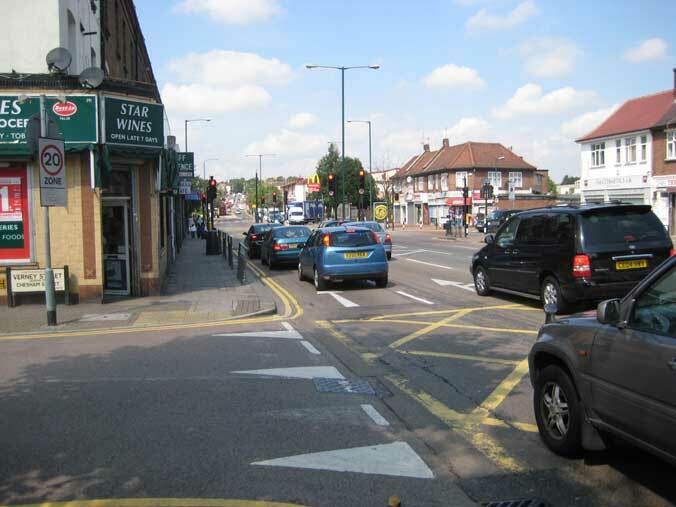 You can't rejoin the road here because (1) there is no dropped kerb, (2) there is no way to cross this busy section of Neasden Lane North, which feeds southbound traffic from Neasden Lane North on to the North Circular eastbound and eastbound traffic from the North Circular off it in various directions, and, (3) if you did cross the road and tried to go north you would immediately be fed on to the northern Neasden roundabout, a terrifying, fast, multi-lane gyratory, seen here in a view from the north, with Neasden Lane North and the underpass exit in the distance. There is a theoretical alternative to all this, indicated with short green and purple lines on the TfL London Cycle Guide No. 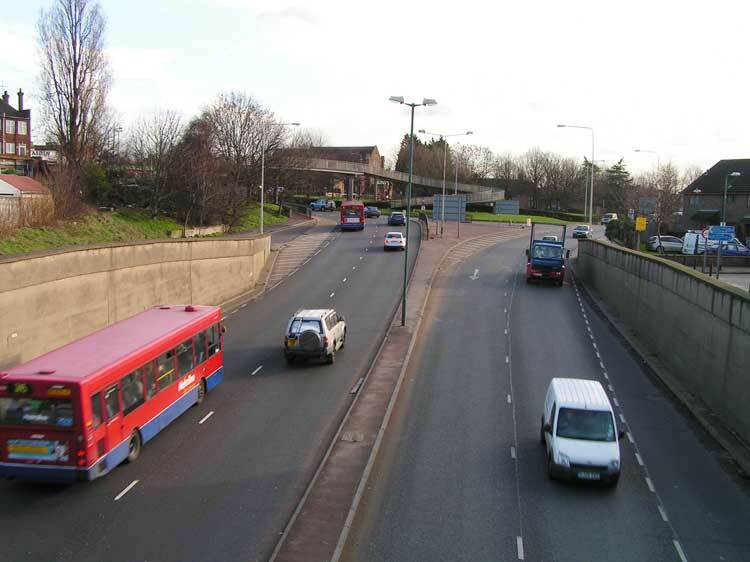 3, which is to take another leg of the the underpass diagonally under the Neasden Lane North–North Circular junction, and then a footbridge to a small road called Vicarage Way, which at least gets you on the correct side of the Neasden northern roundabout, though you still end up very close to fast heavy traffic, to its left. 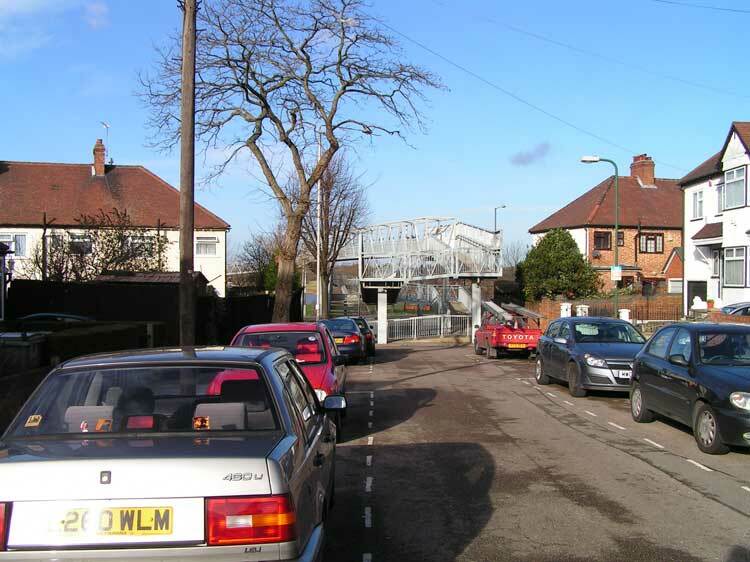 But (wait for it) there are a couple of problems with this: (1) you are not allowed to cycle into and out of this exit from the underpass, as shown by the sign in the view below, and, (2) you are not allowed to cycle on the footbridge leading to Vicarage Way. In any case, with your tagalong child bike, or Christiana, or Bakfiets, that you have bought, inspired by the TfL Catch up with the Bicycle display, I'll wager you won't be able to negociate any of this pathetic "infrastructure". You'll HAVE to use this road, that we are looking down on to here. THERE IS NO ALTERNATIVE. 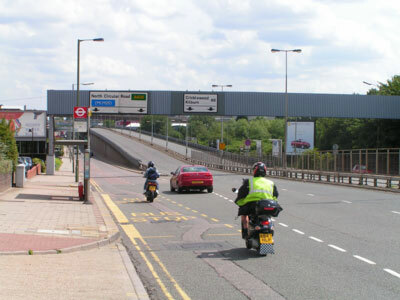 This is the view looking from the non-cycling footbridge into what Brent cyclists call "Death Valley": the vehicle route, the A4088, under the North Circular at Neasden for all traffic heading north-west from the Willesden area. The picture was taken with a good camera in good daylight, but look at the motion blur on those vehicles. Do you fancy keeping to the right of the traffic turning left on to the slip road with all your family in tow? And, by the way, there is another slip road that merges from the left, coming off the North Circular, at the other end of Death Valley. And, if you are going this way, cycling north or west from Gladstone Park, Neasden Station or Willesden, this is not the first barrier you will have encountered, for to get to Death Valley, you first have to negotiate the southern Neasden roundabout, seen in the background in this view, looking the other way from the same footbridge. To continue north-west to Wembley or Kingsbury you carry on over the River Brent, where this road becomes Blackbird Hill. This is another route to which, in Brent, the borough of infrastructural Thatcherism, there is no alternative. For this is where the tiny stream of the Brent (plus the Grand Union Feeder Canal) is first bridged downstream of the Brent reservoir, and this bridge, Kingsbury Bridge, which has stood here since Saxon times, and was last widened for the British Empire Exhibition of 1924 (for which the old Wembley Stadium was built), still carries all the traffic between the north and south parts of the borough: another great environment to cycle in with your kids on their tagalong bike. It is not the slightest bit surprising that families cycling with children are seen round here less frequently than UFOs. Much less frequently, in fact. If anybody wanted further explanation of why, as mentioned in my last post, the wards of Brent to the north of the North Circular have true cycling mode shares probably below 0.5%, here it is. When TfL come up with this crap about just needing to put a bike trailer under the noses of their "low hanging fruit" of Brent parents who are just dying to cycle their kids on these monstrous roads, or trying to negotiate these impossible, crappy, tenth-rate cycle "facilities", I have to despair. What the Dutch and the Danes teach us is that, with cycle facilities, you have to engineer for everybody to make it work for anybody. You have to build your cycle infrastructure to a quality that works safely and efficiently, simultaneously, for 8 year-old children on their own and fit young adult commuters and for everybody inbetween, including every kind of bike and bike trailer. If you under-engineer, or try to cheaply adapt already inadequate pedestrian facilities with just a bit of lining or surfacing, or try to get away with something that some idiot in the council thinks might be "OK for slow cyclists or novices or those afraid of the traffic", you just get unusable rubbish. If TfL can't get together the money and political resolution to implement sensible, safe cycling infrastructure, they should stop trying to promote cycling at all with these ridiculous tents at community festivals. For doing so is simply a waste of money. But, to end with, I'll indulge in a little fantasy. 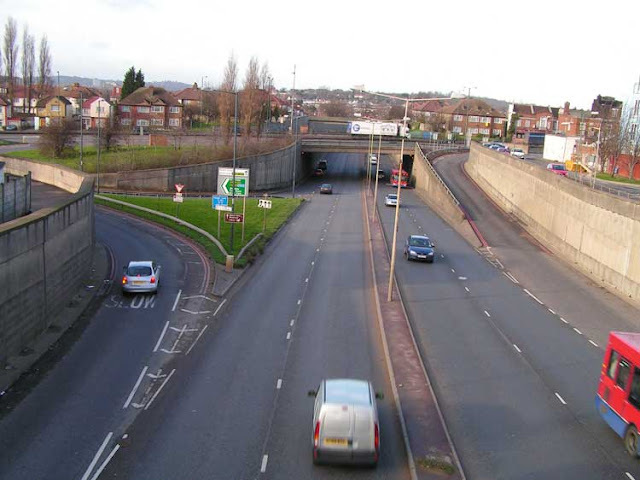 Maybe we could soon get a decent crossing for cyclists of the North Circular Road in Brent: something the Dutch would recognise as cycle infrastructure. Because the North Circular Road–A5 junction at Staples Corner is due to be rebuilt – and not with public money. 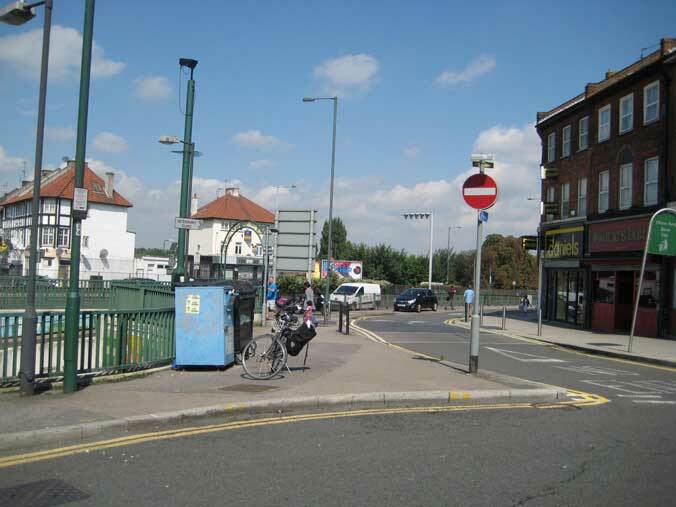 The developers of Brent Cross Cricklewood have to pay for a total rebuild of this junction, as part of their new out of town shopping centre regeneration scheme. 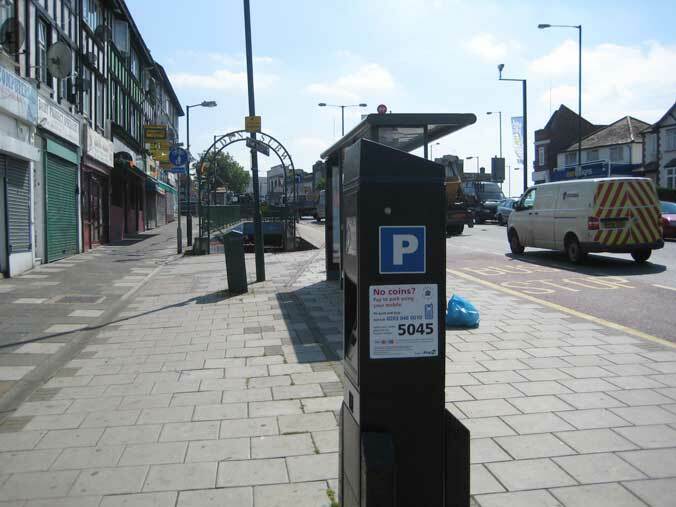 The main company behind the Brent Cross Cricklewood scheme is Hammerson PLC. Hammerson's Development Director during the planning of this scheme was Michael Bear, who now has been elected Lord Mayor of London. (That's the largely ceremonial Mayor of the financial "square mile" of the City, not the post held by Boris Johnson, for my foreign readers.) And he seems to have got quite keen on cycling. So are Hammerson going to give the cyclists of north-west London something like this? I'm afraid I'm not holding my breath. I regularly drive through the "valley of death" (no way I'd cycle there) and, when keeping to 30mph, I get overtaken by buses. 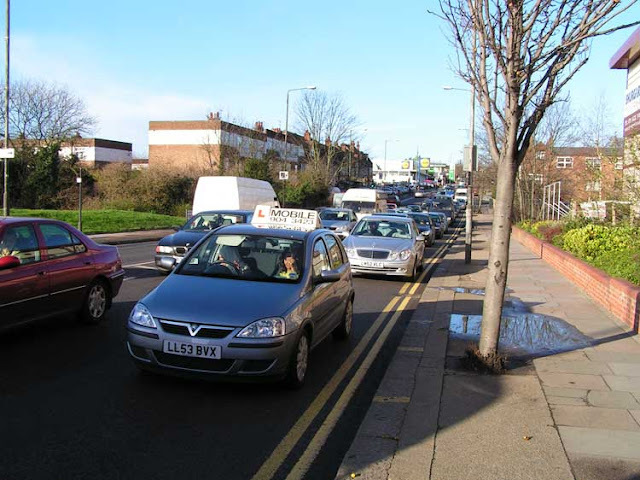 Interestingly, there is a nursery next to the southern Neasden roundabout. My guess would be that the kids there breath in the equivalent of about 10 cigarettes a day. Anyway, even if you make it past the north circular there no cycling facilities whatsoever in the area, whether north or south. 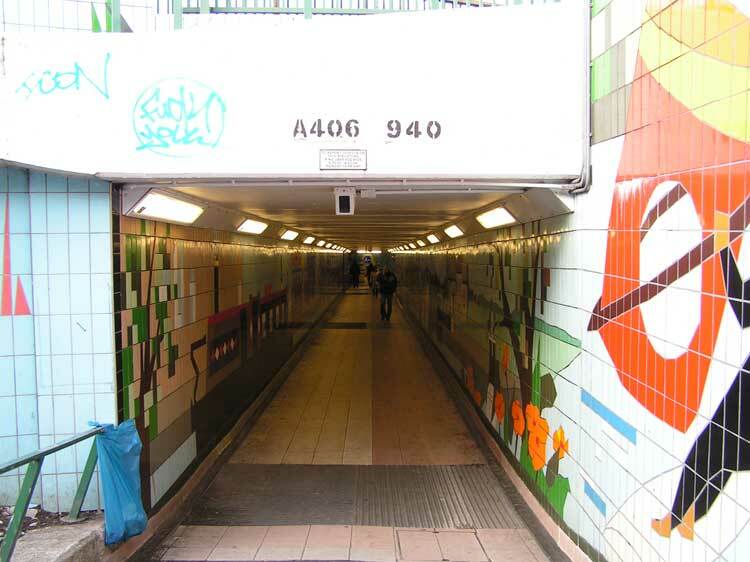 Subways such as that lovely Neasden Subway you pictured are intimidating and potentially dangerous for vulnerable people, especially women. Who would wish to tempt their wife or daughter to go there alone during the day, let alone at night? A 'safe' facility has to be safe from the personal security point of view, as well as from the traffic. Whilst I pity the cyclists north of the river I live close to Blackriars Bridge and up the road from the Elephant and Castle. The connecting road from St George's Circus, Blackfriars Road,is an inner London equivalent of a twin-laned race track. Cars,vans,buses and lorries all race up and down this road at all times of day and night. This is probably one of the reasons that they introduced count down signals on traffic lights at the junction with Union St and The Cut. Yet despite all this the volume of cycle traffic heading north to the Bridge at rush hour is huge and at times exceeds motor vehicles. No research is yet to answer why people cycle here [I stand corrected if there is] but my hunch is a mixture of economic necessity and enjoyment. My point is (and very much echoes your own) that there are large numbers of cyclists out there (already using dangerous cycle ways) whose numbers would increase if safe facilities were created. That means Londoners who cycle would do well to keep the pressure on Tfl and the Mayor in this election year as this is possibly the greatest opportunity we will have to change things to our advantage.